In April I was down in Melbourne for the 8th International Conference on Herbal Medicine. Whilst I was there, VIC Herbs (the Victorian State Chapter of the NHAA) invited me to do a talk to their membership. The topic was “Adaptogens & Nervines – Perfect Pairs”. 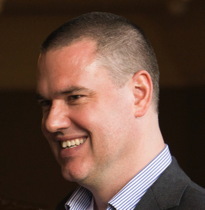 Well due to popular request I will be delivering that same presentation to the Sydney Chapter in June. Rather than just another presentation on individual adaptogens and nervines, I will be presenting the combinations I have found particularly efficacious in practice. For each combination I will examine their particular application and “person picture”, and provide tips for dosage and usage based upon my clinical experience. Download the NHAA Sydney Chapter brochure below for more details and their program for the rest of the year. so sorry I missed your lecture to the Melbourne chapter of NHAA. I was not at conference and for some reason it would seem I missed the notification. 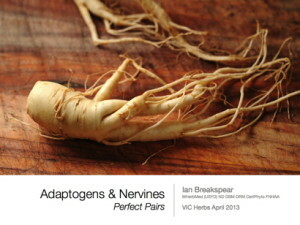 The relationship between nervines and adaptogens is a topic very dear to my heart and could possibly be a suggestion for the NHAA national seminars - perhaps next year? Understanding the differences between the relaxing and stimulating nervines and how to tailor them with adaptogens offers great possibilities in dealing with problems such as raised blood pressure I should imagine? I would very much like to look at your presentation if at all possible. Thanks in advance. Yes they certainly can be a powerful combination. I'll post a brief summary of my talk here on my blog after Monday's NHAA Sydney Chapter Meeting, so keep an eye out. I have noticed that some clients cannot take Withania on its own except in very small doses and yet tolerate it in a mixed formula - particularly one with nervines included. I suspect it is to do with energetics and whether herbs are intrinsically warming/heating and the balance that is offered when cooling herbs are included in a mix. Could explain the traditional valerian reaction we see by some clients who are already in a heated/inflamed state? Look forward to seeing the full presentation at some stage. Perhaps one of the companies like MediHerb/Integria/Optimal Prescriptions or Brendan Penwarden's Health Master's Live series may be interested in broadcasting this seminar. Not everyone is net savvy so BioMedica and Optimal prescriptions do make a CD which they send out with notes and as such can potentially reach a larger audience.